On the day that we celebrate the start of the greatest showpiece in world rugby, we think back to two years ago and the tragic incident that shocked the nation and the rugby community worldwide. 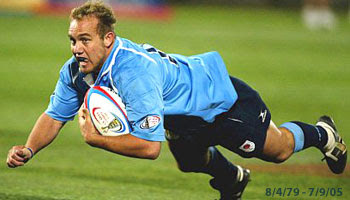 On the 7th September 2005 one of South Africa's most prolific try scorers died tragically in a car accident just outside of Pretoria, ironically, on Botha Avenue. Etienne Botha was a young center who was probably at the height of his career at the time. Playing for the Bulls, Botha was a devastating runner with tremendous skill and quick feet. He dazzled the Loftus faithful for years with his exciting bursts of acceleration and eye for the gap. He unfortunately never got a call up from the Springbok coach, but I feel if he was still alive, by now he would have. Who knows, perhaps he'd be over in France with the Bok squad right now. This compilation clip shows some of the tries he scored in his time as a professional player. His good nature and friendly attitude will be missed, and I'll never forget the seventh of september for that reason. We miss him deeply, one of the best the bulls ever had. Though not a pure speed burner, his running pace whilst "showing" the ball (to draw defenders) is quite impressive. He was also built very well to shrug off shirt tackles. That 2004/05 year was great for him. Too bad that many of the tries shown were against the Lions who were sh** at that time. Lions aside, we were cheated out seeing a special player this RWC. Cheers Ettienne! Fast for such a big guy. He will be missed and I'm sure so will his impact on the game. Sleep well, brother. Well he is sorely missed..he had speed and the ability to find the gap - imagine him and Habana together in the WC - it would be a shoe in. Respects to his family during this time as I am sure they are missing him even more so. Very good tribute, excellent rugby player and certainly would have been in the bok squad at RWC 07, and possibly the first choice 12. Heaven embrace him. What a great player. I'll never forget the day he passed away, only 40 mins drive from where I was on the day. He should have been a Bok in many people's estimation, and I think with time, he would have been. Truly a legend of Bulls rugby, and one of THE most exciting players to witness with ball in hand. Still hard to believe. Very sad, he will be missed.